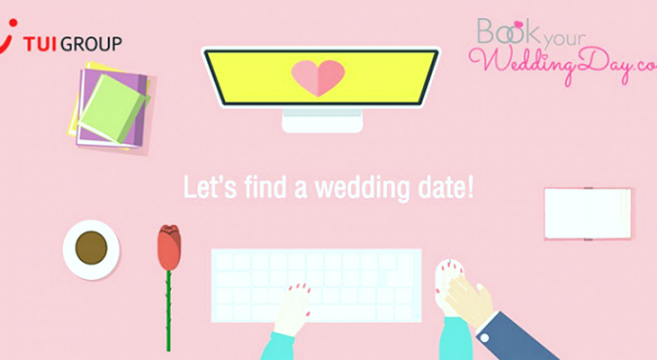 BookYourWeddingDay.com is an international platform which helps couples find their desired wedding day online so as to get married when they want & where they want! This platform is used by many foreign couples who want get married in Greece as it provides the opportunity by following some simple steps to find the desired wedding date & place in all Greek municipalities. Besides finding the perfect wedding date, the platform offers instant online booking of wedding days and venues in Greece. The collaboration of TUI UK and BookYourWedding starts in March, 1st 2017 with 3 year contract duration. The British traveling agency will use the platform so as to aim couples wishing to get married in Greece & Cyprus, do so by following some simple online steps. This is a huge improvement in marriage tourism as the collaboration provides all the necessary services online for every couple wishing to get married in Greece & Cyprus. Now the procedure will be much simpler avoiding all bureaucratic barriers and obstacles.